As such, an embryo should hatch out of its zona pellucida (a glycoprotein coat) in order to make physical contact with the inner wall of the uterus called endometrium and attach itself by means of implantation. This process is called hatching. The zona layer protects and safeguards a fertilized egg during its journey towards the blastocyst stage of pregnancy (5th or 6th day post fertilization). Usually, the zona eventually becomes thin and ruptures thus leading to implantation. If zona doesn’t hatch successfully, embryo doesn’t get implanted and thereby, pregnancy doesn’t occur. What is the basic idea behind ‘Assisted Hatching’? The basic principle behind Assisted Hatching is easing the implantation of the embryo on the endometrium. In this procedure, a hollow is made externally on the zona pellucida of the blastocyst (implantation stage of embryo). This hollow is just a small groove and not some deep-seated complete hole. The purpose of initiating this groove pre ET (Embryo Transfer) technology during the IVF (In vitro Fertilization) cycle is simplifying the embryo hatching process and preventing injury of its cells. Assisted Hatching can be initiated by both physical and chemical methods! As such, laser is preferred the most because it’s safe and reliable. Laser can make accurate, precise and quick depressions on the trophoblast without causing any injury to the cells. Who is Assisted Hatching a blessing for? Assisted hatching is a blessing for aged women, especially those above 37 years. It also helps in implantation in women who have had previous failed IVF cycles, unsuccessful frozen embryo transfers and thicker zonas. Although there isn’t really enough proof to show that Assisted hatching helps increase live birth rates, however, it may have a positive impact on clinical pregnancy rates. How Safe is Assisted Hatching? As such, assisted hatching is prescribed to you only if you have any of the aforesaid conditions. 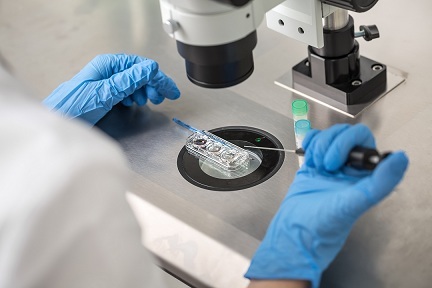 However, Assisted Hatching using laser is known to show no negative impact on the health of the baby because it causes minimal damage to the inner cell mass of the embryo. Chromosomal aberrations are also nil. ⟵How to Choose the Best Maternity Hospital?